If you are trying to get honeymoon cruises cheap, you can search for short, inexpensive cruises. But what if you want all of the amenities that come with a more elaborate cruise without paying those elaborate prices? There are some ways that you can get the honeymoon cruise of your dreams for much less than the prices seen on the cruise ship websites, but you’ll have to remain flexible as to where you visit, when you travel, and what excursions and amenities you enjoy along the way. If you’re willing to book your airline tickets along with your cruise and aren’t against requirements to stay at a specific hotel when on land, then you could take advantage of bundled or packaged honeymoon cruise deals. This takes a lot of the stress out of planning a honeymoon vacation because your accommodations are made all at once, but you give up the luxury of determining which hotels you want to stay and which cruise ships you want to board. The advantage is a discount over what you would pay when booking all of those arrangements separately. The later you book your cabin, the less choices you will have because the best cabins often sell out months in advance of a cruise date. Some cruise lines also offer discounts for passengers paying for their trip far in advance of their trip. Take advantage of those discounts by snagging your cabin as soon as you find an affordable deal that meets your needs. We just told you to book in advance, but you should keep your eye on websites that report last-minute deals as well. When a cruise ship needs additional passengers for an upcoming trip, they often slash prices just to get people like you on board. You’ll still have access to many of the amenities and services offered to passengers who paid much more for their trip. The downside is that you may have to jump to your honeymoon without much planning if you go this route. If this advice seems confusing, keep this tip in mind: never rule out any opportunity. Look as far into the future as you can while keeping an eye on the last-minute deals. You’ll either snag a great discount by booking in advance or you’ll find a great deal on short notice and jet off to your vacation spontaneously. 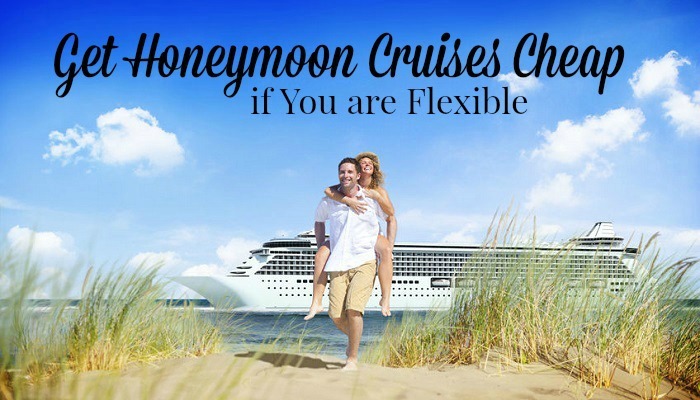 Either way, your flexibility will reward you with a great price and a memorable honeymoon cruise. You can also increase your chances of finding an affordable cruise if you watch all cruise lines and all destinations available. Are you willing to travel on land a bit more in order to open your flexibility as far as the city of departure? If so, you may find that the same cruise is cheaper if you leave from one port rather than another. Sometimes the smallest things make a big difference in the price. Determine where you want to cruise, and then figure out the peak months of travel to those destinations. If you can select a cruise date that falls just outside of that peak season, you’re likely to see lower prices per person boarding the ship. The weather doesn’t change instantly when peak season arrives or closes, so you still have a great chance of enjoying beautiful weather when you get off board for excursions. If you’ve been searching for discounts on honeymoon cruises for some time, you may be close to throwing in the town and planning a staycation instead. Before you do that, spend a little time following these tips for securing a lower price on a great honeymoon cruise. You never know what you will find if you’re simply willing to remain flexible with your travel arrangements. All cruise lines have lags where they would love get more people on board, and you can take advantage of that need now that you know how to find the opportunities.